By the way, I was in Chicago last week for the Society of Actuaries Predictive Analytics Symposium. I took some pics, which you can see at my livejournal here. While in Chicago, I paid no soda tax, because I drank either water or non-soda-things that had bubbles in (aka beer and prosecco). I will say I did enjoy the train ride from Midway airport to the downtown loop and the train ride from the loop to O’Hare. One thing that NYC does very poorly: get you from the airport to downtown in a convenient way. Gotta say my fave such transport is Denver. Editorial: Welcome to Cook County, Mayor Bloomberg. You’re getting played on the soda tax. Michael Bloomberg, the billionaire former mayor of New York, is free to write political checks all day long in Cook County. If he wants to contribute big bucks to support the county’s new soda tax, that’s his call. He’s committed to spending $5 million so far. We’d just ask him, the way we’d ask any out-of-towner who seems unsure of local customs: You recognize you’re getting played, right? In New York, Bloomberg surely knows to avoid sidewalk games of three-card monte. 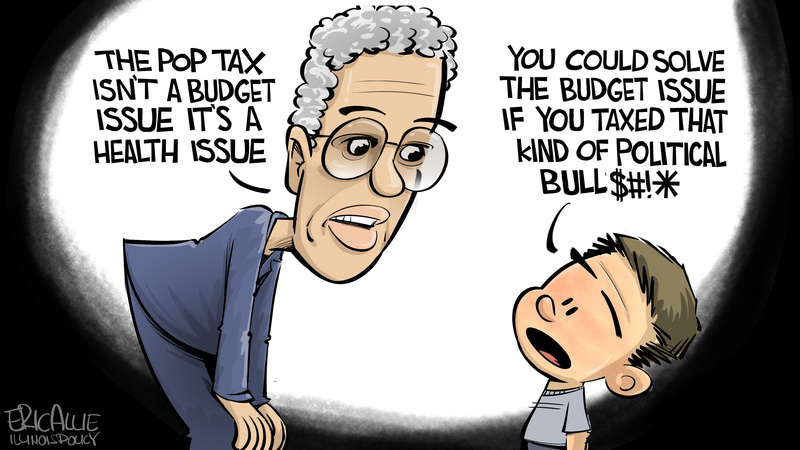 In Cook County, beware of politicians peddling tax increases. Whatever their stated motives, chances are that money disappears into the black hole of bloated county government spending. The new Cook County penny-per-ounce tax on sweetened beverages is misguided and unpopular, to the point that it’s headed for possible repeal next month. Some people count calories. We’re counting the days until Oct. 11 when the Cook County Board, meeting as a Finance Committee of the whole, is expected to take up repeal of the pop tax. Bloomberg is a true believer in using government power to influence the health habits of citizens. He’s perturbed by soda. As New York’s mayor, he tried to ban jumbo-sized sugary drinks, a move rejected by the courts. Bloomberg contributed millions to pass soda taxes in Philadelphia, San Francisco and elsewhere. Now he’s pouring money into Chicago broadcast ads and mailers while promising to spend “whatever it takes” to support the campaigns of County Board members who may face anti-soda tax opponents in 2018. Again, that’s his choice, as is the decision by opponents, including the beverage industry, to wage a repeal campaign. But Bloomberg is being bamboozled. If he were interested in spending money on a public health initiative in Cook County, we could point him to others, including anti-violence programs rather than this dishonest grab for dollars. It’s not even logical as a health initiative. It applies to bottled Starbucks Frappuccinos but not those prepared by baristas at Starbucks locations. It applies to soda but not fruit juice, which is loaded with sugar. The tax can’t be charged on purchases made through the Supplemental Nutrition Assistance Program, or food stamps, so 872,000 county residents are exempt. I am just fine with Bloomberg being played for a fool, especially since money he wastes on promoting soda taxes is money not wasted on idiotic gun control laws. In any case, Bloomberg’s soda tax ads are about as successful as his anti-gun ads. A We Ask America poll taken Thursday and Friday targeted a flurry of advertisements that link the tax to health concerns. Former New York City Mayor Michael Bloomberg has spent $5 million on ads supporting the Cook County sweetened beverage tax — citing the health benefits of fewer pop sales. The Cook County Board of Commissioners will meet on Wednesday, when an anti-tax proposal is expected to be heard. Commissioners who voted against the tax have introduced a measure to repeal it, although Cook County Board President Toni Preckwinkle — who has taken much of the heat for the tax — has said she expects it to stand. The survey also asked whether respondents wanted the tax repealed “no matter what the reason” — finding 84.8 percent in support of a repeal. More than 83 percent of those polled were Chicago voters in support of a repeal, with more than 86 percent of those polled in suburban Cook County also wanting a repeal. I’ve covered the We Ask America polls before (and yes, the polls are being funded by retailers who are getting hurt by the soda tax). Let’s look at the most recent polls. You can see the survey results in total here – I don’t feel like making a graph, because they look just that same as the polls from a month earlier, as noted by the pollsters. With mounting pressure, a vote on the repeal of the soda tax was delayed for another month. After significant pressure from Cook County Board President Toni Preckwinkle and other allies, county Commissioner Sean Morrison, R-Palos Park, made a motion to refer to committee his soda tax repeal ordinance. Citing the sweetened beverage tax’s mass unpopularity and implementation problems, Morrison and county Commissioners Richard Boykin, D-Oak Park, John A. Fritchey, D-Chicago, Timothy Schneider, R-Bartlett, and Jeffrey R. Tobolski, D-McCook filed an ordinance to repeal the unpopular tax. Morrison had intended to use a procedural maneuver to suspend the rules and immediately call the item to a vote. Rule 2-107 (z) (1) allows for the suspension of rules provided two-thirds of commissioners (12) approve. Citing a desire for a full vetting of the repeal, Morrison opted to have the matter proceed by way of standard operating procedure. The item is now in the hands of county Commissioner John Daley, D-Chicago, and the Finance Committee. It’s expected that a hearing will be held Oct. 10 or 11, leaving taxpayers waiting weeks and possibly even months for a resolution. Even if the repeal vote passes by a simple majority (9 votes), Preckwinkle is likely to veto. Commissioners would then be required to obtain a three-fifths majority (11 votes). When the Cook County Board originally approved the tax in November 2016, the board voted 8-8 with Preckwinkle casting the tie-breaking vote in favor of the measure. Those who voted in favor of the tax were county Commissioners Daley, Luis Arroyo, D-Chicago, Jerry “Iceman” Butler, D-Chicago, Jesus “Chuy” Garcia, D-Chicago, Stanley Moore, D-Chicago, Ed Moody, D-Crestwood, Deborah Sims, D-Chicago, and Larry Suffredin, D-Evanston. Of course, that’s before they found out how unpopular the tax was going to be. 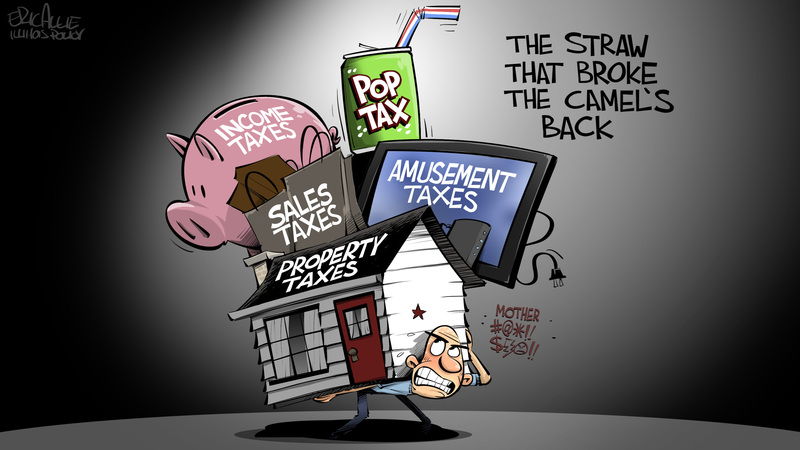 As I mentioned in my last soda tax post, several of these soda-tax-voters could be in trouble for elections next year. Eric Allie at Illinois Policy Institute has a few cartoons commenting on this. Looks like it was taken from a karaoke system. Some of these are Philadelphia, Portland, and other places. DUN DUN DUUUUUUUN! You know what else has a dark history? U.S. federal sugar policy. 25 July Illinois and Chicago Round-Up: Soda Taxes, Holding Legislation Hostage, Tiffs over TIFs and More! 17 Aug Cook County Soda Tax: Look Who’s Come to Save the Day! 18 Aug Cook County Soda Tax: Persuasion and Comparisons – Why Not Tax Juice? 20 Aug Sunday Dumpery: Yes, It’s The Soda Tax – What’s It To You? 30 Aug Soda Tax Gone Global: Is It Sweeps Week Yet? Thanks for pushing off the repeal, Preckwinkle!